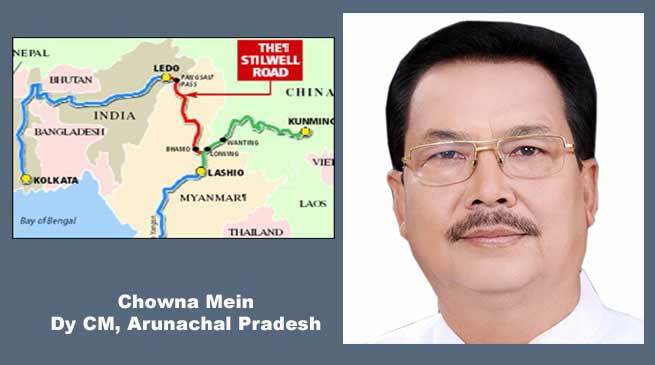 The historic Stilwell Road needs to be revived for boosting our trade relation with ASEAN countries, said Dy Chief Minister Chowna Mein in the interactive Session on Act East Policy held at New Delhi. Deputy Chief Minister attended a meeting today under the Chairmanship of Union Minister of External Affairs Smt. Sushma Swaraj with Chief Ministers of North Eastern States regarding integration of North Eastern States into the “Act East Policy”. In the meeting Deputy Chief Minister stated that the ASEAN held a great promise for development of North East India which has many cultural similarities with the ASEAN countries. The North East is our gateway to ASEAN. He further emphasised that if proper initiatives in connectivity are taken it will transform North East in the coming years. He advocated that the historic Stilwell Road needs to be revived for boosting our trade relation with ASEAN countries. He said that the India-Myanmar-Thailand Trilateral Highway connecting Moreh with Mae Sot, Thailand via Myanmar also held a great hope for us, as did a trade corridor linking all North Eastern States with the Indo-Myanmar-Thailand trilateral highway. In the field of Air connectivity, it was pointed out that no Indian airlines private or public provides direct air connectivity to ASEAN. The Government of India may explore providing viability gap funding to any airlines which provide direct air connectivity from North East to ASEAN countries on the lines of Udaan Scheme. In regard with Trade and Commerce he stated that the North East has great potential to offer in terms of agriculture, Horticulture, Bamboo, Timber products etc to the ASEAN region. The time in transportation by road to the rest of India is higher and will cost more in marketing of goods than with the geographically nearer ASEAN region and Bangladesh. The DCM outlined that tourism can be the fulcrum of India’s Act East Policy. Engagement of the ASEAN through tourism will be a win-win situation for both India and ASEAN countries. There is a pressing need to market the whole Northeast as one Tourism destination. North East Tourism Development Council should take a lead in making this concept a reality by coordinating with all the Tourism departments. The other thrust area could be Buddhism in North East as Arunachal Pradesh and Sikkim hold important seats of both Mahayana and Theravada Buddhism. Arunachal is visited by thousand of Buddhism pilgrims who can’t always afford come by air. In order to facilitate mass pilgrims, visa on arrival facility may be provided at Moreh, Manipur and Pangsau pass in Arunachal Pradesh.